By now, you’ve probably noticed that artificial intelligence is making its mark across a range of industries and roles. AI is changing how we perform at our jobs, how we interact with brands, and even contributing to the growing class of superhuman workers. That said, the role of AI in customer support is particularly noteworthy – especially because smart technology has so many different uses within the realm of support. In fact, research by Gartner predicts that by 2020, we can expect to see 85% of all customer interactions handled by AI without the involvement of a human support agent. It seems pretty clear that the future of customer support hinges on the availability of AI-powered technology – but that still doesn’t tell us why so many businesses are investing in AI. So, let’s discuss why and how machine learning is so beneficial to a company’s customer support efforts. Combining the power of AI with the capabilities of human support agents gives companies the ability to provide the high level of service their customers expect and deserve. Here’s a quick look at four specific reasons we’ll continue to see a growing presence of AI in customer support. 24/7 availability: Artificial intelligence doesn’t take time off for holidays, evenings, or weekends – which means customers can get the answers they need whenever they want them. AI-powered support solutions give businesses the ability to provide reliable customer support, anywhere, anytime. Faster solutions: Automating aspects of customer support means shorter wait times for responses, since AI is often able to dig up solutions faster than a human can. Where human agents are often slowed down by the need to do research or type out a response, AI always works with precision to minimize your average handle time. This ensures every customer receives answers and support solutions as quickly as possible. Better resource management: Companies that introduce AI-powered support technology (like chatbots) and self-service solutions (like forums) ensure their agents spend less time handling simple tier-one requests. Instead, their customer support agents are able to focus on resolving more complex tasks that require a human touch. 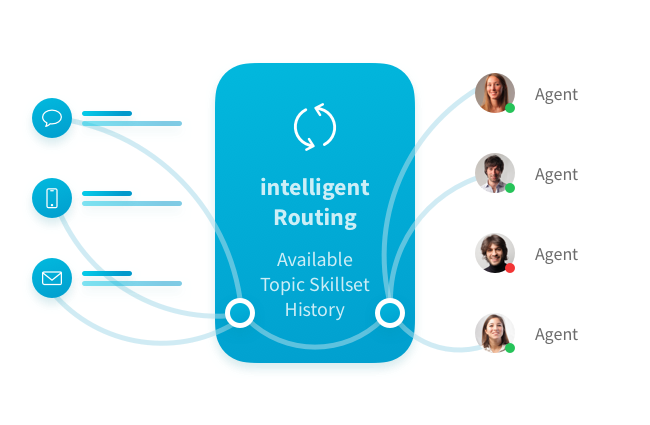 Another perk is that AI-powered support systems only require one-time training; they keep getting smarter over time, even if you don’t invest additional resources into training it. More satisfied, valuable, loyal customers: Satisfied customers are loyal customers. Not only that, but happy customers tend to spend more and have a much higher customer lifetime value than their unhappy counterparts. So, it’s certainly worthwhile to provide better customer service experiences – especially since boosting customer satisfaction is known to reduce abandonment rates, increase retention, and lower customer churn. Your customers are asking for low-touch, digital support options – and AI is the answer. But what does AI-powered customer support look like in practice? And where can you find examples of machine learning in customer support today? Check out these nine real-world applications of AI in customer support. Manually responding to routine email inquiries can eat up your resources by taking agents’ attention away from more complicated issues. Fortunately, AI can help agents cut through a large volume of support emails by generating a selection of custom response that can be sent off with the click of a button. So, rather than writing a response from scratch or copying and pasting from a selection of canned replies, agents can simply choose the best custom option from the AI-powered suggestions provided. This can dramatically reduce the time spent replying to routine inquiries, improve customer satisfaction, and cut back on your overall average handle time. Social media presents a valuable opportunity for brands to connect with customers. Whether a customer contacts you with questions about delivery times, tracking a recent order, or resolving a support issue, social channels like Facebook messenger make it easy and convenient for consumers to reach you. The trouble is that customers expect speedy responses at all hours of the day. And, since your average response time is listed right on your Facebook business page, the pace at which you respond might influence whether a customer even bothers to contact you in the first place – or chooses to message a competitor instead. The good news is, thanks to AI-powered chatbots, customer support teams can use technology to ensure every message is answered quickly, even during off-hours, holidays, and otherwise busy periods. 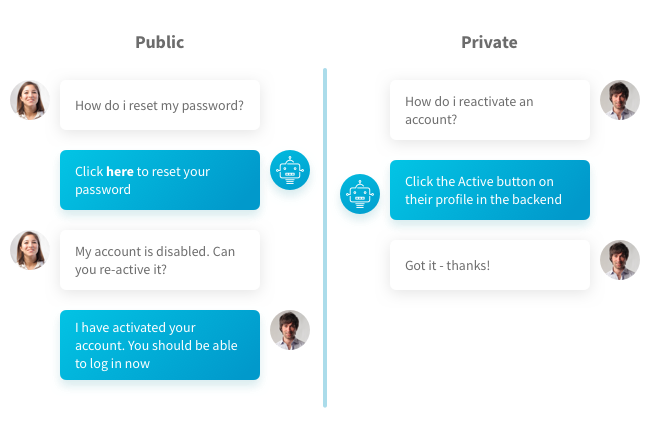 These smart chatbots use artificial intelligence to deliver customized responses in real-time. An AI-powered customer support system like Relay allows your agents to focus fully on the customer, without worrying about creating a ticket or logging conversation details. That’s because the platform uses smart technology to automatically create support tickets based on conversation details and context. So, regardless of channel, the support agent doesn’t have to switch between different tools to make notes or track data. AI takes care of everything related to data capture, so the agent can just focus on resolving the issue at hand. Natural language processing (NLP) is one of the core components of AI-powered customer support solutions. This is how smart software (including smart assistants like Siri and Alexa) is able to interpret and respond to written and spoken information. Using voice recognition and language processing tech, support teams can offer better customer experiences with traditional low-touch support solutions, like interactive voice response (IVR) systems. This saves time for both the company and the customer, while also cutting down the on costs. Not only is AI handling some customer inquiries without agent involvement, it’s also working alongside human support teams to optimize the effectiveness of individual agents. For instance, AI can screen incoming support inquiries to decide how a customer best be assisted and direct them to the appropriate agent or department. 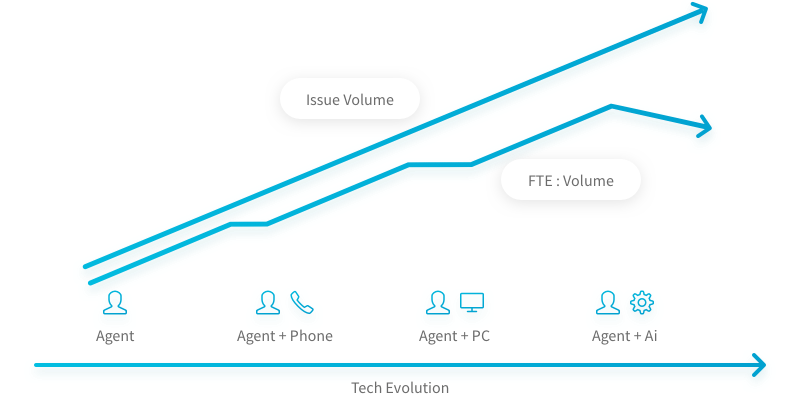 Not only does this help manage channel volume, but it also ensures every inquiry is routed to an agent with the appropriate knowledge and experience needed to solve the issue. This results in faster resolutions, more reliable support, and greater efficiency for your organization. Intelligent chatbots can do more than just chat; they can be programmed to complete certain transactions. For example, some businesses allow customers to place orders, update contact information, or find nearby locations by simply interacting with a chatbot on their website. In the context of customer support, customers appreciate an AI-powered messenger or chatbot that allows them to quickly schedule a service call, report an issue, or make changes to their account – all without waiting for a support agent to address them. Once again, this frees up human agents to assist other customers with more complex support issues. Even when a customer interaction isn’t handled entirely by chatbots, AI-powered customer support solutions ensure human agents are able to optimize their performance. AI-assisted customer support helps agents stay up-to-date on customer data, surfaces answers more quickly than would be humanly possible, and takes care of mundane tasks so that agents can be more productive. So, for example, if you call a support line and the agent already knows everything about your case, it’s likely thanks to a centralized database managed by AI software. Businesses can use AI to collect customer information and contact details for authentication or follow up. Furthermore, AI can instantly update the internal database your agents use for reference. This ensures everyone on your team has access to completely up-to-date information on a customer’s purchase, transaction, and support history. By using machine learning to manage customer data, you’re able to cut back on research time and increase service accuracy. This also results in happier customer support agents because they’re always armed with the information they need to do their job well. In the retail industry, data is used to define and analyze a shopper’s unique customer journey. Similarly, intelligent data analysis can help customer support teams deliver personalized, predictive support based on a specific customer’s history, channel preference, and previous support requests. Even better, support teams can use AI for smart technology monitoring that allows them to pinpoint issues the moment they arise – which means agents can anticipate support requests and begin working on a solution before the customer even contacts them. If you’re looking to keep up with the competition (and rise to meet shifting consumer expectations), your best bet is to adopt a smart, AI-powered approach to customer support. The Relay support platform enables B2B support teams to take full advantage of a range of customer service solutions powered by AI. By introducing smart support solutions, like chatbots, network monitoring, and automated ticket creation, businesses can adapt to meet consumers’ growing preference for low-touch support interactions. So, if you’re ready to work smarter instead of harder, find out how our intelligent support solutions can transform your support team into customer service superheroes. Want to become an expert on delivering incredible customer experiences? Sign up to receive monthly updates on the latest and greatest content and tips from our blog, sent straight to your inbox.